‘Tis the season for out-of-office emails! Yes, with all the holiday planning of feasts and gifts and decorations, there is also the important task of drafting your holiday auto-responder text. You need to let your colleagues and clients know that you’ll be away from your desk celebrating the spirit of the season (and not reading their emails!). Yet, sometimes compiling the right words can be a bit daunting. You want to be polite, clear, firm, and perhaps even a little festive. Plus, it’s often a task we leave until we’re just about to run out the door for a holiday break. To ensure your out-of-office email is thoughtful and useful, we’ve compiled all the important information and three handy (copy-and-paste ready!) out-office-email examples. Email is one of the top tools for business communication. People expect swift responses to their requests. If this expectation will not be met because you are away from your desk, your client or colleague needs to know. Leaving an email without a responder can appear unprofessional, lose potential business and, worst of all, make you look like Scrooge! The main goal of an auto-respond email is to ensure clarity of communication expectations and offer appropriate alternatives. You can include the range of dates that you will be away, but ultimately the sender wants to know when they can reach you again. Generally, people will indicate that they will reply to the email when they return. However, some people may have inboxes that require a week to manage after vacation. Others do not read all the emails sent in this period. In these special cases, indicate when the reader should actually expect a response or request they re-send their email on the return date. Alternatively, some people will check their email while on vacation. Then, the text should indicate how often people may expect their email to be seen and acted upon. If you are unavailable and a client needs contact, a colleague’s contact information can be included. The text should also indicate when it’s appropriate to contact the alternate. Some people will indicate that the contact is for urgent matters while others may offer for consistent client care. While it’s common sense, always discuss and confirm the hand-over with your alternate. Ensure they are well-equipped to properly handle the request while you’re away. You want to be able to properly relax with your egg-nog knowing your urgent emails are in good hands. Thank you for your email. I’m currently out of the office, returning on [return date]. Your email is important to me and I will respond when I return to my desk. If you require immediate assistance, please contact [Alternate Name] at [alternate email]. Thank you for your email. I’m out of the office and into the cookies and eggnog right now. I’m celebrating the holidays with my loved ones and will not be checking my email until [return date]. I hope you will be celebrating the season soon. However, if your email is time-sensitive, please contact [Alternate Name] at [alternate email] and one of our busy elves will be happy to help. Thank you for your email. I’m away from my desk until [return date] trying to corral my kids between family visits and holiday sugar highs. I will find a few moments of holiday bliss once they watch Elf for the seventh time this month. I’ll seize the quiet to check my email once a day. I will only respond to urgent matters but will reply to all emails upon my return. Whether your go for professional or funny, the most important task of this email is to clarify communication. 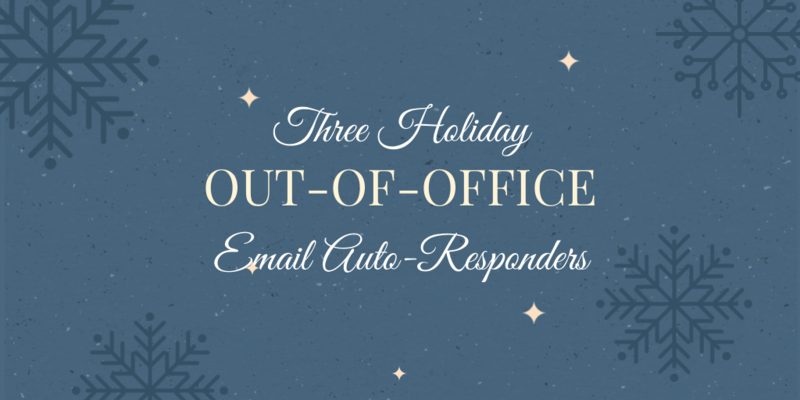 A well-prepared auto-responder email will allow you to better enjoy your holiday break.